Welcome to Q4! The time of year everyone loves to hate… budgeting for the new year. With countless ways to spend your marketing dollars, it’s important to weigh what will give you the biggest bang for your buck against your marketing goals and overall company goals. 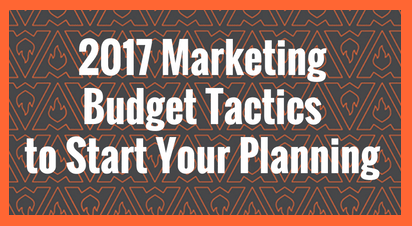 Here are 5 tactics that may help you tip the scales when allocating your budget for 2017. The first step in your budget development process should be a good honest assessment of where you stand today as a marketer. Do you hit your targets on a consistent basis? How can you adjust your marketing strategy in order to grow and adapt new channels in 2017 and generate an even better ROI? If people, partners or systems don’t support your core goals through performance, they may be good candidates for the chopping block, or you should both rethink your strategy for 2017. Identifying and recruiting both internal and external partners can be one of the biggest contributions you make to your marketing plan. Ensuring those partners are able to build and execute an integrated marketing plan is key in order to drive results that meet your digital marketing initiatives all while driving your cost per lead/conversion/click. A good marketing partner will likely pay for itself with the revenue they generate through digital marketing. It’s a Win-win! This one can be a game changer for our nonprofit friends and partners. If you are a non-profit company, Google could provide you with a $10,000 monthly Pay-per-click grant. FREE MONEY! That’s an additional $120,000 per year in-kind AdWords for your already stretched marketing budget. Don’t let this one pass you by. Take a look at your website. Now take a look at your top competitors’ websites. Who would you call first based on your user experience? Is their site mobile friendly and easy to navigate? According to Google, more searches are initiated on mobile than on desktop, 4 out of 5 consumers shop using their smartphones, and 93% of people who research on mobile – make a purchase. Google has also adjusted their search results to focus on mobile friendly site. If you are in need of a site overhaul, get this into your budget now, it will be money well spent. In 2016 the average company were expected to allocate 30% or more of their marketing budget to digital marketing. This rate is expected to grow to 35% by 2019. Search engine marketing will capture the largest share of online spend, with display advertising (banner ads, video, etc) coming up second. Social media advertising will continue to expand and grow as an overall share of online marketing spend. 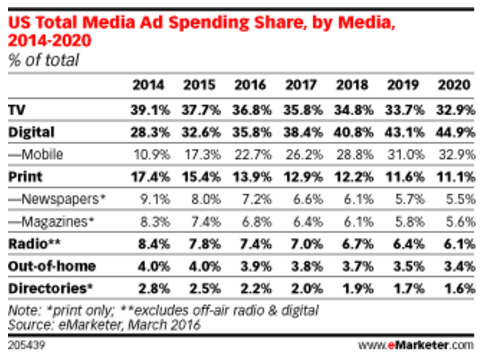 The chart below from eMarketer projects that “…digital ad spending in 2017 will equal $77.37 billion, or 38.4% of total ad spend.” This marks the first time in history that digital spending surpassed TV ad spend in the US, and it’s only expected to grow.